A superb model, filled with features you’ll love and offering one touch convenience. Pricey, but worth it! Recommended for: Anyone who can afford one. Are you the type of coffee drinker who places a premium, but reserves the right to take almost total control of how your specialty coffee drink tastes when you feel like letting your inner Barista out to play for a while? 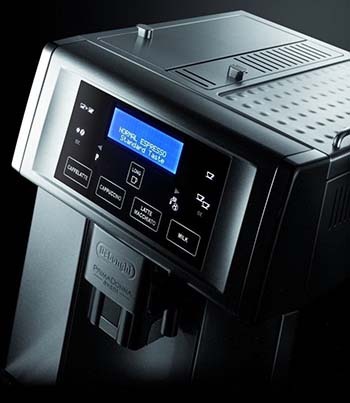 If you answered yes to that question, and don’t mind spending the money for a top of the line system, then you’re going to love our extended DeLonghi Gran Dama 6700 review. This machine gives you the best of all worlds, offering a variety of one-touch, bean-to-brew coffee drinks while allowing you to fine-tune your coffee creations to a degree that many other models on the market today simply can’t touch. Sure, you pay a bit of a premium for the ability to have it both ways, but by the time you reach the end of this review, we think you’ll agree. This is one of the strongest super-automatic models on the market today. It offers just about everything you can imagine and wraps it up in a handsome package that’s ready to serve coffee on demand, any time you want it, day or night. We’ve had some people ask if these are two different, but highly similar models. They are not. The model goes by the Prima Dona name when marketed outside the US, and Gran Dama inside the US. The giveaway is the fact that both bear the “ESAM6700” designation. Now, on with our DeLonghi Gran Dama Avant Review! One of the first things you’ll notice about this machine is that it’s metal. A lot of models being sold today try to keep their costs down by constructing the frame of the unit with ABS plastic. While there’s nothing wrong with that—it is a reasonably sturdy material, after all—there’s just something solid and permanent about a machine that’s built with a mix of aluminum and stainless steel, and that’s what you get with the ESAM6700. In addition to being a rugged, durable machine that can take pretty much anything you can throw at it, it’s also quite a striking design. Its bold lines reveal an undeniable European styling, and yet, it manages to be both stylish and functional. While it’s true it doesn’t use cutting edge technology in its display; it doesn’t need to. DeLonghi has managed to offer a striking number of control options and still keep it simple, so the older LED technology is not detrimental to the overall function of the machine in this case. One thing to warn you about though: This is a relatively sizeable machine, measuring 11.1” x 14.8” x 16.8,” and weighing 29 pounds. There are certainly larger and heavier machines on the market, but if you’re cramped for kitchen counter space, it may prove challenging to find the DeLonghi Gran Dama Espresso Machine a permanent home. Once you do, however, you’ll wonder how you ever got along without it. There are two major things we love about the ESAM6700’s water tank. First is the fact that it holds an impressive 60 ounces of water, which is more than enough to keep pace with even the most rabid coffee drinker. Second, it’s front loading, and even better, you don’t have to completely remove the tank to refill it. Just pull it out far enough to access the fill port at the top, and add more. Highly convenient! It also has a water filter, which we have a mixed opinion about. We understand why people like them. Using a water filter saves a lot of time where maintenance is concerned because it virtually eliminates the need for descaling. On the flip side though, those filters are expensive, and over time, they’ll significantly increase the total cost of ownership of your already very expensive machine. When you consider that there are other ways to minimize descaling, including using distilled water, or if you’re already getting filtered water into your house thanks to a filter installed on your kitchen tap, it’s just an expense you may want to do without. There’s no “right” answer to this question. Ultimately it comes down to what works best for you. This is another strength of the model, and our DeLonghi Gran Dama 6700 review would be incomplete if we didn’t call particular attention to it. The grinder is pure awesome, being a ceramic conical burr with, count them, thirteen grind settings. Grinders come in two basic flavors: Stainless steel and ceramic. Stainless steel is considered inferior to ceramic because the metal heats when you use it. That can burn your grounds, which in turn, can utterly ruin the flavor of whatever coffee drink you’re making. Ceramic gets around that problem entirely. Even better, the thirteen offered grind settings is huge because finding the right grind for whatever drink you’re making and that satisfies your personal tastes and preferences is one of the keys to making a great drink. While five or six settings works for a fair segment of the market, it’s just not a sufficient number to dial into your flavor preferences precisely. The Gran Dama Avant allows you to do that. This is not a machine you’ll outgrow and is one of the reasons that coffee purists will love it. 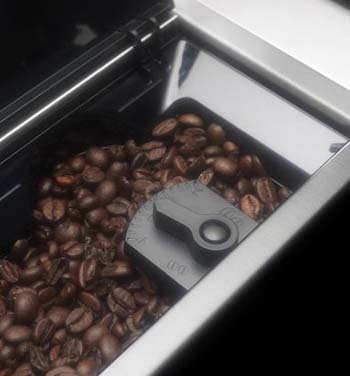 If we have one quibble, it is with the size of the bean hopper attached to the grinder. It only holds 7 ounces of beans. In our view, that’s too small when considering the size of the water tank. We’ve seen this on more than a few models, and the problem is that when there’s a size mismatch like this, you have to stop what you’re doing more often than you’d like to refill one or the other. We’d love to see the hopper capacity expanded by two ounces or so. One final thing to mention here is the bypass doser. It’s a small but significant detail, and if you don’t want the whole bean experience, you can just pop in a scoop of pre-ground coffee for a quick cup, any time you like. This is yet another great feature. 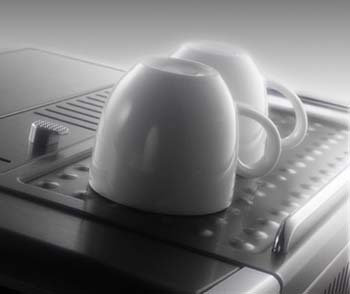 DeLonghi Gran Dama features a double boiler, which allows you to simultaneously steam milk and brew coffee. Most models on the market today only have a single boiler, which means you have to wait for the boiler to shift gears and adjust the temperature from one task to the next. It’s not a long wait, but it is inconvenient. You don’t have to worry about that with this machine. Both boilers are aluminum, lined with stainless steel, and both feature Thermoblock technology for rapid heating, which further reduces your wait time. Well done, DeLonghi! 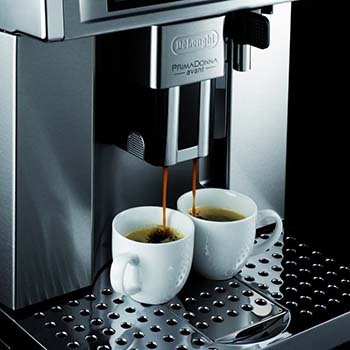 Yet another strong feature implementation for the Gran Dama DeLonghi coffee machine is its telescoping spigots, which move up and down to accommodate a wide range of cup sizes from 2” for a shot of espresso, all the way up to an impressive 6.” Again, we love it! One of the things we love about DeLonghi machines is the fact that the brew unit is removable, so there’s no mucking about with cleansing tabs. Just pop it out about once a week and give it a good rinse, and you’re all set. Keeping the brew unit clean is an important step because that’s where the coffee making magic happens. The control panel on the front face of the machine is your window into that system and the means by which you can modify the factory settings for the pre-programmed drinks. That’s plenty for most people, and of course, since you can change multiple drink settings, you can use these one-touch buttons to make pretty much any drink you desire. Despite the fact that there’s a lot you can change, and despite the fact that the display uses old LED technology, navigating the menus is a simple affair, thanks to a well-designed navigation system in general. While it’s true that there is a bit of work to be done when you first unbox the machine, don’t let this intimidate you! Most of this stuff only has to be done once, and when you’ve got your preferences programmed into the system, from then on, you’re all set to enjoy one-touch operation and pure convenience. Here’s another small but important detail that our DeLonghi Gran Dama review wouldn’t be complete without. If you’re new to the world of specialty coffee drinks, you’ll probably find this of interest. If not, then just skip to the next section. Espresso lies at the heart of most specialty coffee drinks, and if you’re used to drinking drip-brew coffee, it’s important to understand the differences between how it’s made and how the coffee you’re used to drinking is made. If you use a drip-brew machine, then the means by which your coffee gets from the reservoir to your cup is simple gravity. The water is pumped into the grounds chamber after it’s been heated, where it slowly drips down into your waiting pot or cup. Espresso machines use pressure. Pressure is measured in bars, and one bar is equal to atmospheric pressure at sea level. It takes at least 9-bars to make a good shot of espresso, and the 6700’s pump is rated at 15-bars. 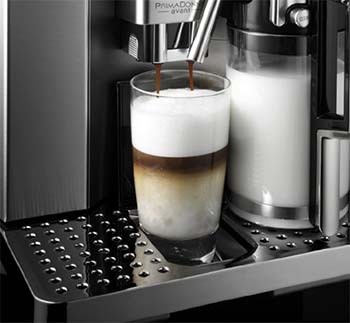 All that to say, you won’t have any trouble getting world-class espresso from your machine, every time you use it. And now you know! Okay, so we’ll say up front that coffee purists are probably going to be disappointed with the Gran Dama Avant ESAM 6700’s implementation here because it uses an auto-frothing system, rather than a proper frothing wand. Before you judge it too harshly, however, you owe it to yourself to give it a try. There are several things to like here. First, the unit comes with a plastic carafe you can pop in the fridge when you’re not actively making a milk-based drink. Second, there are no plastic hoses to deal with that make your machine look like a high school science project. You simply pull out the hot water spigot, plug the carafe into the slot, position the milk spout so that it hits your cup, and you’re ready to go. Note that on a lot of the models sold, you have to manually move your cup from the “milk side” to the “coffee side” when making a milk-based drink. That’s not the case here, thanks to the model’s excellent design. All the coffee making magic happens without ever having to relocate your cup, which is fabulous. Even better, the milk spigot has a control dial that allows you to set varying levels of foam. While it’s true that this isn’t as flexible as giving you a frothing wand to work with, it gives you more control than you might imagine and is incredibly convenient. We were skeptical, but it won us over, and we regard it as one of the many strongpoints of the 6700’s design. Specialty coffee drinks were meant to be enjoyed at temperatures lower than most Americans like their coffee. If you come from the drip-brew world, they may not seem hot enough for you. That’s especially true in cases where you’re making a milk-based drink, because you have to steam milk at a lower temperature than you brew coffee, and when you mix the two ingredients you lose heat. If you dispense into a cold cup, you lose even more, and this is what the cup warming tray helps counteract. Try making your favorite drink again with pre-warmed cup on the warming tray. You will be amazed at the difference it makes in the temperature of your finished product! Despite the fact that the machine utilizes old, LED technology, the menu system is quite simple to navigate, and will present no problems, even for people who aren’t tech savvy. 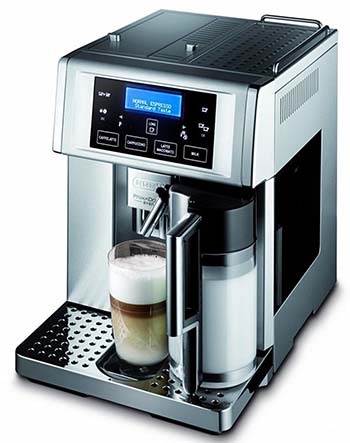 This is not to say that there’s no learning curve at all where the DeLonghi Gran Dama ESAM6700 is concerned, but after making 3-4 drinks and familiarizing yourself with the way the menus and controls work, you’ll have effectively mastered the machine. 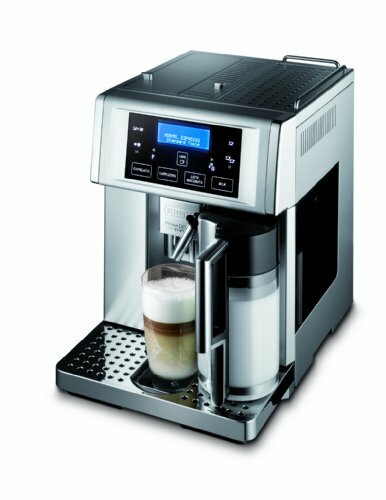 Plus, if you mostly stick with the one-touch drink selections this model offers, then after you program in your preferred settings, there’s not much to do. You just put your cup under the spigot, push the button, and enjoy. Where cleaning is concerned, once again, the 6700 shines. In fact, some users have complained that it spends a bit too much time running self-cleaning cycles! 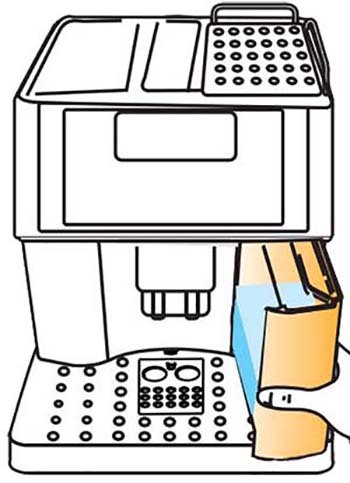 For instance, it will do a thorough rinse when you first start the machine, and another when you shut it off for the day, and it will prompt you to do a cleaning cycle after each milk-based drink you make. If you’re not using a water filter in your tank, you’ll be prompted at periodic intervals to run a descaling routine, and you’ll want to take the brew unit out once a week for a good cleaning, keep the drip tray and dregs box empty, and things like that, but all of those features are easy to access, and present no particular challenge. Our only complaint about the DeLonghi Gran Dama Avant ESAM 6700 is its relatively small bean hopper. It’s just a bit too small, given the size of the water tank. If we were engaging in blue sky thinking, we’d love to see an upgrade to a TFT (Thin Film Transistor) display, which would allow for the creation of and easy access to user profiles so that multiple coffee drinkers could save their favorite settings. That’s certainly not required, but given the size of the water reservoir, the machine can certainly keep pace with a large household. Other than that, though, we love it just the way it is. And there you have it. 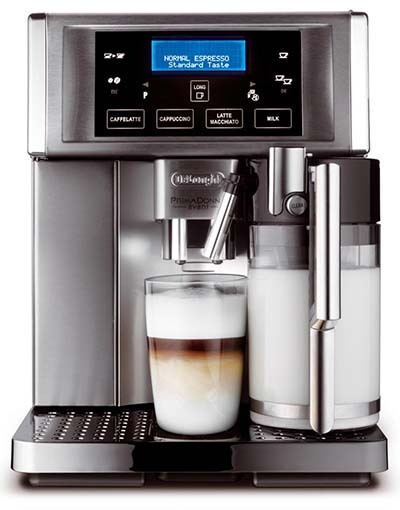 Having read our Delonghi Gran Dama 6700 review, we think you’ll agree that there’s almost nothing not to like about it. It’s a beautifully designed, robust machine that will quickly become an indispensable addition to your home kitchen. It’ll spoil you silly, and within a week, you’ll wonder how you got along without it. We highly recommend this model to anyone who can afford it, from absolute beginner to diehard coffee purist. While not a perfect machine, it comes awfully close to hitting that mark. What is Specialty Coffee? Royal Cup Coffee. How Flavors in Specialty Coffee Are Identified. Peritus Coffee Roasters. The Art of Roasting Coffee and Why It Matters. Camano Island Coffee.